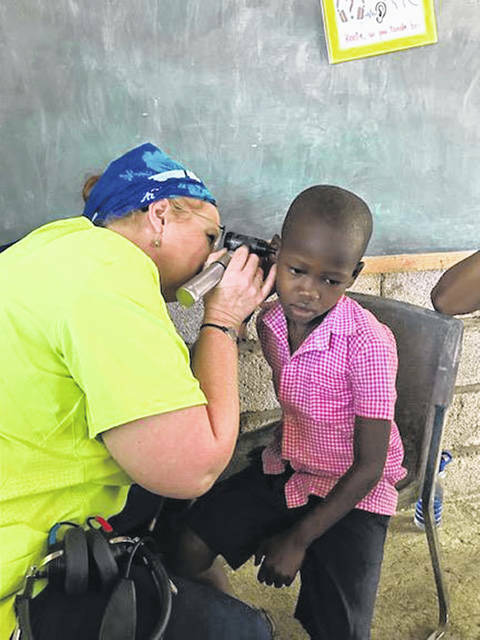 Vanessa Lee, of Wapakoneta, owner of Sidney Audiology, checks the ear of a Haitian child during a recent mission trip. Vanessa Lee, of Wapakoneta, owner of Sidney Audiology, visits with a child in Haiti during a recent medical misson trip. 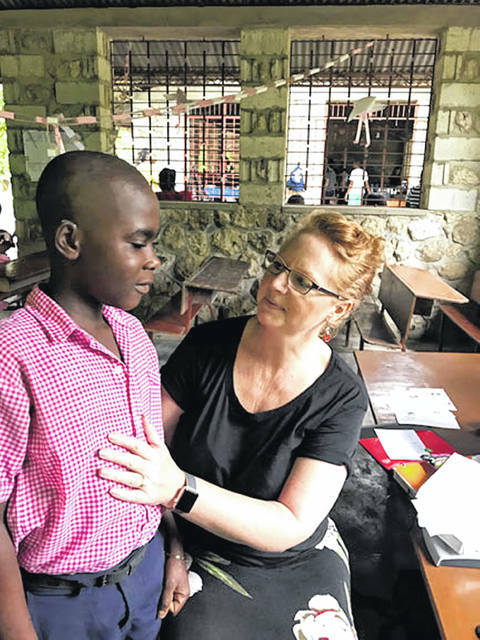 SIDNEY — Once a year — usually in November — audiologist Vanessa Lee, of Wapakoneta, travels to Haiti as part of a medical mission team. The owner of Sidney Audiology, 671 N. Vandemark Road, and Auglaize Audiology in Wapakoneta tests the hearing of Haitian residents and fits them with hearing aids when necessary. As a member of a team sponsored by Mission Possible, based in Findlay, Lee spends two weeks traveling into rural communities that are an hour and half outside of Port au Prince, Haiti’s capital city. Pam Macke, Mission Possible medical coordinator, said it was never in the organization’s plans to include an audiologist. A Haitian ear, nose and throat doctor makes the rounds with Lee. Along with hearing aids, which are donated by Signia, the audiologist carries batteries and dry-and-store units. “I use a lot of desicant packs to keep things from getting too much moisture, because the humidity in Haiti is high,” she said. The team stays in a center owned by Mission Impossible. It’s bunkhouse living in a compound surrounded by fencing and constantly guarded. They take cold showers, but they have great food, Lee said. “We have a wonderful Hatian cook. We eat well. There are a lot of rice and beans. Fresh avocados and fresh mangoes are one of the perks. They think of spaghetti as an American meal, so the first night is always spaghetti. For breakfast: oatmeal, eggs, corn mush. They had to learn not to spice things up too much. They like spicy,” she said. The drinking water at the center is run through a filtration system, and the team carries water with them when they go into the field. Because the schools that Lee visits in the field have no electricity, she had to acquire testing equipment that runs on battery power. “One of the things that stresses me out is if I forget something. It’s not going to be available. I forgot the syringe I use to take impressions last year. I went to the medics and said, ‘What’s the longest syringe you have?’ It wasn’t big enough, so I went to the guys who were working (construction) and said, ‘I need a drill.’ Or you can email the next team that’s coming down and ask them to bring one,” she said. The center has email availability, but only for work issues. No one checks personal email there. Lee decided to join the team after she saw a Mission Possible presentation at her church. She liked that the organization’s motto was “A hand up, not a hand out.” Patients pay what they can for the services. When she learned that the program’s teams see 2,000 children each year, she figured that some of them had to suffer hearing loss. And she was someone who could do something about that. “When God tells you to do something, if you’re me, you try to do it,” she said. When there’s a need, you do what you can to meet it. After 14 years in Wapakoneta, she had expanded her clinic to Sidney in 2018 because she saw a need. “There was a place (here) that had hearing aid fitters, but they weren’t audiologists. There were people who came to Wapak because there was no one in Sidney doing Medicaid. We get people (here) from Greenville and Springfield because others don’t cover insurance. Because I’m impassioned about helping people hear, I want to serve the whole community,” she said. Others in the Sidney office are receptionist Brenda Brackman, of Fort Loramie, and office manager Trisha Copland, of Wapakoneta. Sidney Audiology is a Medicaid and Medicare provider, contracts with veterans agencies and accepts most insurances. Lee noted that it’s the insurance companies who determine whether someone can make his own appointment for service or whether he needs a referral from a physician. “Call your insurance company to see if you need a referral,” she said. “We also see lots of veterans. If they don’t want to travel to Dayton, they can call the VA and then get referrals from the VA, so we’re a community care provider. We’re also trying to take care of patients who have hearing aids whose provider has closed. “If anyone thinks they need help with hearing, but they think they can’t afford it, they should contact us, because we have affiliations with agenices like Sertoma and Opportunities for Ohioans with Disabilities (who can help with the cost),” she added. The phone number is 937-638-0023. The clinic tests hearing and fits hearing aids. It sells several different brands, because different brands solve various hearing problems. Lee earned a Bachelor of Science in communications disorders from Bowling Green State University and a Master of Audiology from Ohio University. She is an adjunct faculty member of Bluffton University, where she teaches audiology. Lee hopes to add another audiologist to the Sidney staff soon. She would also like to recruit more audiologists for the Mission Possible team so that people in Haiti could be seen more than once a year. “It’s not enough, but it’s a start,” she said of her annual visits. She likes seeing the children there. “I’ll see over a hundred kids a day. That’s what I enjoy. I enjoy the interpreters. They’re usually 20-something young men and I have 20-something sons, so I like talking with them. The heat and humidity are a shock to the system, but the mission center is on the ocean. I go to sleep hearing the sound of the ocean and wake up to the sound of the roosters. There are chickens everywhere in Haiti,” she laughed.